The head of a Barbochos, or Barbet Français/b]. Notice how the coat is wooly and the hair grows down, not straight out( like an afro) and is neither frizzy, nor bushy. He is in the standard up to 2006, where and when, by raising the size of the dogs, he was automatically eliminated. This standard was applied immediately and without ever discussing it with breeders. Many were delighted to see the Barbets Français eliminated to make room for the poodle crossings with whatever. He has never been listed on any website and especially not for mating as no databases who advertise males ever wanted any of Mrs Pêtre's dogs: Barbochos de Reiau de Prouvenco, because they are not 65 cms tall! How could they be? They're old bloodlines from previous standardsssssss! He is a fantastic partridge and rabbit hunter and lots of people have seen him in the vineyards around Reims, France where he lives. There are about 6 different coat types on Barbets, depending on what bloodline they have. There is not one way to groom them...just like the hair on your own head.The best thing to do is ask your breeder how to handle the coat. The worst and most difficult one being the tight frizzy curls. 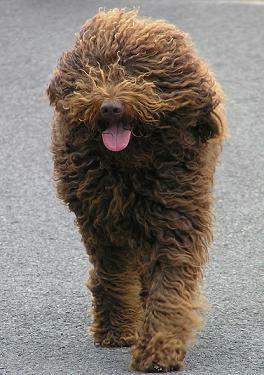 These dogs have to be shaved because the coat is completely unmanageable. I speak from experience ahnd having to deal with my Vera girl! He was for his natural hunting capacity "invited" to attend a presentation of hunting dogs last fall of the Regional Canine Society...member of the SCC. Keep in mind that most of the Barbochos de Reiau de Prouvenco are not listed anywhere (except for one: Borée)because the webmaster has never asked the breeder, Mrs Pêtre to list them. Mrs Pêtre is now 80 and no longer breeds, the C litter, 2007 being the last one. 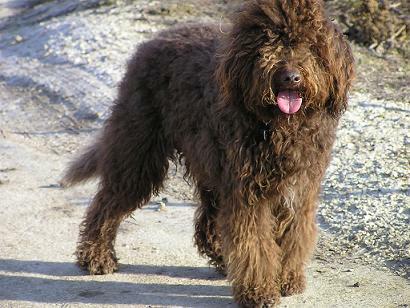 Out of solidarity with her and her old Barbet français bloodlines I have always refused to list my dogs anywhere other than on my own site. The frosting on the cake? 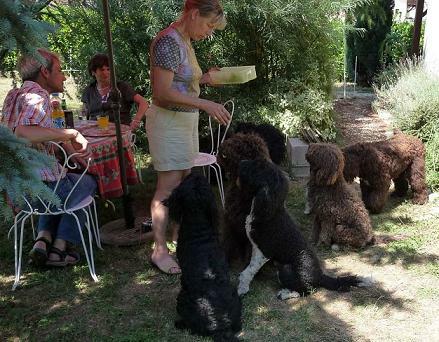 A person from the Swiss Barbet club breeding commission and webmaster of the databases, filed an official complaint* at the SKS, against the Barbochos de Reiau de Prouvenco this past spring,because someone from Finland wanted to put some[b] Barbet français blood back into a dog( omygod). 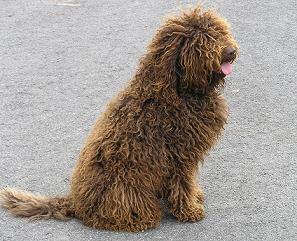 This poor dog has been forbidden to reproduce where he has A hips and Barbet blood in his veins and had produced a litter of 13 very Barbet français typed pups. But in the land of the Grand Barbet...imagine! Oh horror. *She wanted to stop the litter from being registered. Can you imagine? Have a look around different websites, you'll see. 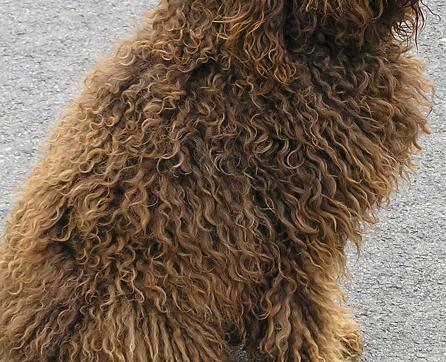 A Barbet françaisbloodline has Barbet blood from Barbochos descendancy and promote that aspect...not poodle and SWD crossings or whetever else. 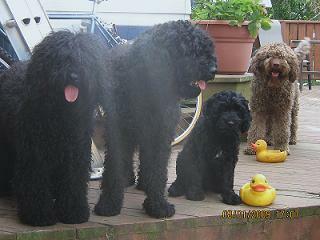 AND the objective of some breeders is to eliminate progressively the poodle blood which has so damaged the breed. 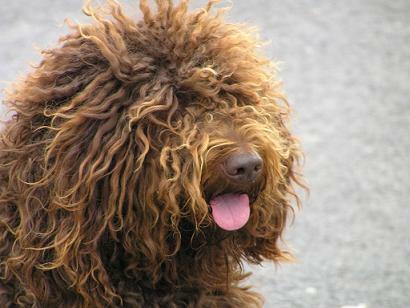 Am reworking the Spanish water dog line, coming up soon. 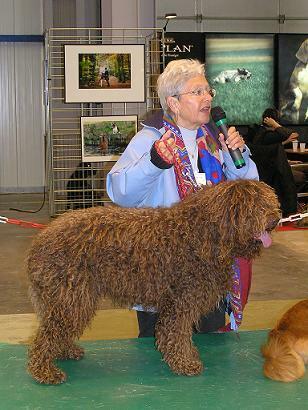 There will be 34 Barbet at the club show, plus a few more around not signed up to compete. 2001 in Besançon: this was a normal CACIB show where the club had really made an effort to make people attend. 42 Barbets of which 14 Poppenspaler's. 2003: I don't have the figures. 2005, Club show:54 Barbets. This is when they measured the dogs and arbitrarily changed the standard without asking for anyone's opinion ( which is illegal, btw). From left to right: Serafina, Bonnie, Disque d'Or and Cigale at Paula's in Ontario..I do need to tell you all the trouble Paula and Ula (now) have gone through to build such a fantastic diversity in bloodlines.Look at this! Also ponder on how much work went into organizing and just simply doing it...I say wow! ................lettuce. They also eat apples, of course, but also cucumbers ( good for the skin), mirabelles,and of course dry bread.